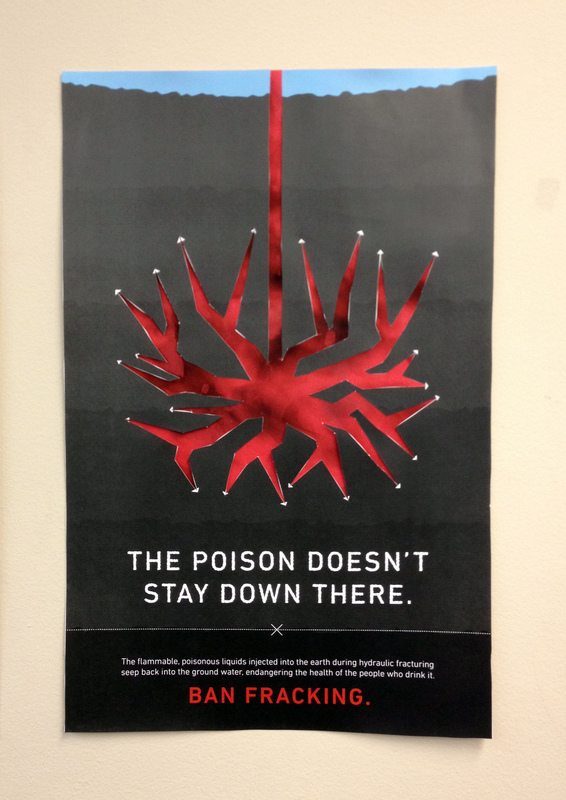 The purpose of this poster is to increase the general public of the dangers of hydraulic fracturing. It assumes that the audience has a basic knowledge of what fracking is, and attempts to illustrate one particularly nasty danger of the practice—the leaching of poisons into the water supply. After seeing the poster, people should have a greater awareness of the dangers of fracking. This poster was designed to stand out on crowded walls and bulletin boards. Its dark, ominous colour scheme and unique, charred texture will set it apart from other colourful posters. 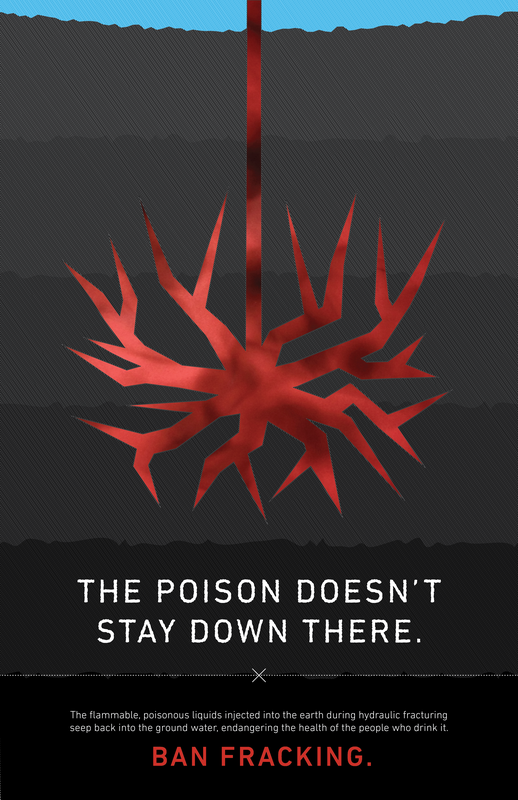 Although the text is also very important, the strongest feature of the poster is a spider-like fracking crack that occupies the centre of it. It will attract people’s attention, and once they come closer to look at the poster they will be able to read the words. The poster is clearly about a negative issue, so the copy is written in a scientific, neutral style, so as not to overwhelm the viewer with the message. Another important criterion for the poster is for it to look very professional. It seems that often anti-oil campaigns can look quite amateur, as there is usually not much financial support for them. It is easy to dismiss a message if it is on a cheap-looking poster, so this poster was designed to look professional and to delver the message in a classy way. This was done using the font DIN pro, a neutral but elegant sans serif, and a muted, dark colour palette. There is lots of space around the words and objects, which makes the poster look calm and intentional. 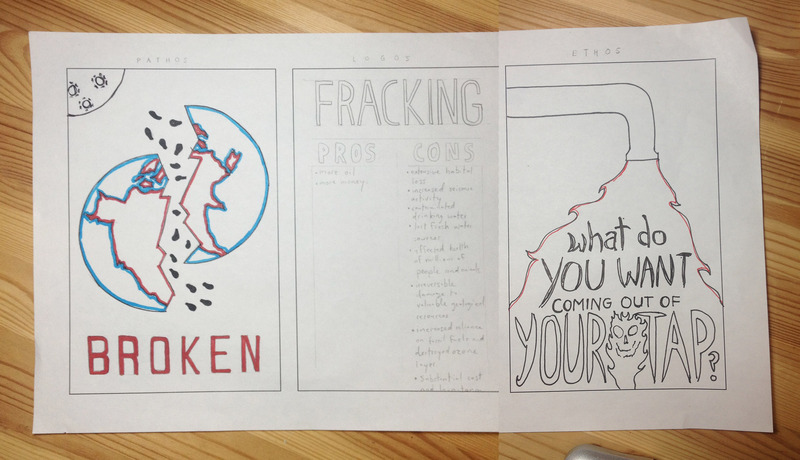 A goal of the poster was also to convey the idea of fracking destroying the earth, but in a symbolic, simplified way. This was achieved by using increasingly darker greys going down the poster to show layers of the earth, and a geometric yet random-ish spider shape for the cracks. There was a thin layer of blue at the top of the poster to represent the drinking water table that fracking destroys. 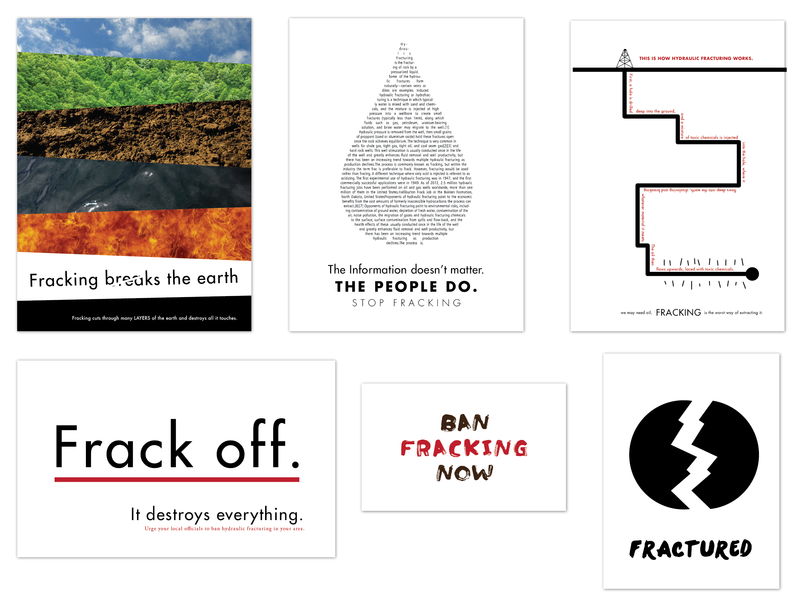 All of these elements combine to create a poster that catches people’s attention with its creepy imagery and then delivers the message that hydraulic fracturing poisons water supplies. I’ve recently been working on my poster trumpeting the cause of banning hydraulic across the land. There are many potential approaches for this topic, including Pathos (emotion), Logos (logic), and Ethos (ethics). I think that most good campaigns would use a combination of the three, but below is a little experimentation with using them individually. After playing around with hand drawn ideas, I decided to move things onto the computer and try a few more ideas. The methods of Logos and Ethos were appealing to me more than playing with people’s emotions. I think that trying too hard to pull on people’s heart strings can cheapen the message, and especially with such a strong, persuasive case such as banning fracking, there is no need for it. I find that logic and ethics lend themselves to a simplistic, clean design, so that the message really shines through. Below are a few of the poster trials from my experimentations. As I thought more about the final product, an ad campaign I had seen in the Toronto subway system came to mind. 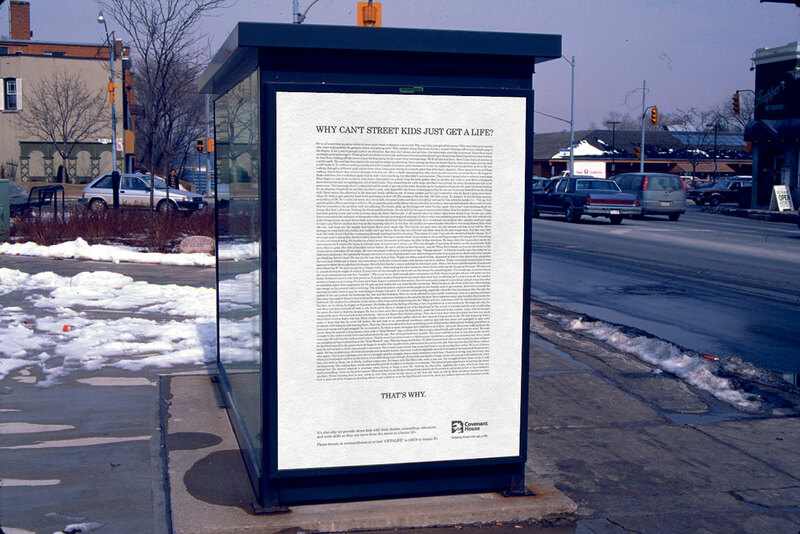 It is an ad for homelessness awareness, which could be a very emotional, sappy issue. But instead of going for your emotions, this ad presents a clean wall of text that tells a story about a day in the life of a homeless child. It doesn’t assault you with its message, and gives the viewer the freedom to read it or not. And I have a feeling that a lot of people do! Inspired by this, I thought I would try the idea of a “wall of text”, and use it as a figurative representation, as well as a means of delivering lots of information. I use the text to represent the ground that is being drilled into in the fracking process. The drill line and subsequent fractures wind through the text, parting it as they go. I typeset the text at a small enough size that from a distance it looks almost solid, and there are enough words on each line for them to fit around the fracture lines. At the top and bottom I put the tag line “Could you please frack off?”, which is supposed to be an edgy play on the profane-ish sound of the word “frack”. It is in a messy, bold typeface called Fingerpaint, that looks a little like smeared oil or blood, and gives it a rough, organic texture that contrasts with the rigid smoothness of the other text. I chose to make the poster very long and skinny to play on the incredible depth of a fracking site. Some of these sites can go up to 10,000 feet deep. Making the poster thin gives it an interesting look, sets it apart from other standard posters, and lets the concept come to life. I’m going to keep developing this concept, but I like how this poster works on two levels: the initial impact of seeing the obvious representation of a fracking well, and also the more subtle but substantial information delivered when the viewer comes closer and reads the body text of the poster. I am staring to work on a graphic design project around the issue of hydraulic fracturing for oil and natural gas extraction. What follows is the research conducted by my partner Joel Eckel and me. What is the nature and scope of the issue? Hydraulic Fracturing, or “fracking”, is a controversial method of extracting oil and natural gas from the ground. It is performed by injecting highly pressurized liquids into depleted oil and gas deposits in the Earth’s crust to cause the rock to fracture and release additional fluids. The liquid injected is usually a mixture of water, sand, and chemicals such as hydrochloric acid, ethylene glycol, and isopropanol. The quantities of material used in modern fracking are massive, with up to 8 millions gallons of water and 320,000 lbs of sand being used per well. While the technique is very effective, and has created a large upsurge in the amount of oil being produced worldwide, it is associated with many serious health and environmental concerns. These include the contamination of ground water supplies, risks to the health of people living near fracking sites, increased seismic activity, increased atmospheric emissions and and reduced air quality. Fracking has come into more common use in the last decade, as the world’s supplies of oil and gas have begun to dwindle. A company can use the practice of fracking to extract large amounts of additional oil and gas from deposits that had been depleted using traditional extraction methods. This is a worldwide issue that directly applies to any country that has natural gas or oil deposits, and indirectly applies to all other countries due to the widespread environmental damage it can cause. The issue is particularly contentious in Canada, the USA, and Europe, where there has been oil and gas extraction occurring for hundreds of years, and fracking could extract substantial amounts of additional resources. It is necessary for providing the world with the energy it needs. It brings economic prosperity to the locations where it occurs. Burning natural gas is less environmentally harmful than coal, so it is doing good by offsetting coal burning. Fracking uses extraction sites that have already been drilled, and does not cause as much environmental damage as starting a new drill site. The toxins injected into the ground leach into groundwater and poison all the animals and humans that drink the water. The gases released into the air through the fracking process do damage to the environment and speed global warming. The actual fracturing of the stone causes unnatural seismic activity that can disturb the environment. Who are the players involved in each side? There are three mean stakeholders involved with fracking. The Industry, The Public, and The Government. The primary goal of The Industry is to extract natural gas through the means of fracking with the intention of satiating the increasing global energy demand. They do this in the most economical means as, like any business, the end goal is profit. However, the extraction of natural gas often incorporates some negative externalities, especially in regard to the environment. As a means to promote fracking, the industry hires lobbyists to persuade the government to create legislation in favour of fracking. This legislation affects the prominence of fracking by either restricting social and environmental regulation or by granting them autonomy. There are two main contributions from The Public in regard to the prominence of fracking. First, the public actually creates the demand for energy, which then creates a necessity for fracking as the demand for natural gas is substantial. Additionally, there are those in the public the gain financially from the profit that fracking creates in the oil and gas industry. This is often where the government finds most of its pressure to deregulate fracking. Conversely, there are groups in the public such as NGO’s, scholarly institutions, and community action groups. Most of these groups fund research on the industry, present their findings, or petition the government against fracking. Therefore, there is a dichotomy created within The Public as some have intentions to profit form the industry while others see it as a destructive means to provide energy. The government is in charge of the legislative decisions that affect the fracking industry. They are primarily concerned with preserving the countries natural resources, while simultaneously meeting the demand for its energy needs. They are pressured from the industry to promote fracking through lobby groups, as it is a profitable business, and they are also pressured by the public to restrict fracking as they see the externalities too destructive. In some regard it is a fickle balancing act that is often contested. What are the historical roots? The practice of hydraulic fracturing for oil and gas extraction was first used experimentally in 1947. Its first successful commercial use occurred in 1949, when the Haliburton Oil Company licensed the technique and began to use it in many of its oil extraction projects, fracking 332 wells in the first year alone. The company reported 75% production increases. Other companies caught on to the new invention, and by the 1950s, 3,000 wells a month were being fracked. Since then, over a million wells have been stimulated using the technique. The chemicals mixed with the water have changed substantially over the years, and now there are more than 600 different chemicals that are used in fracking fluid. There is currently a worldwide discussion occurring about the acceptability of fracking, with no definitive answer forthcoming. Are there any marginalized or oppressed social groups as a result of the issue? 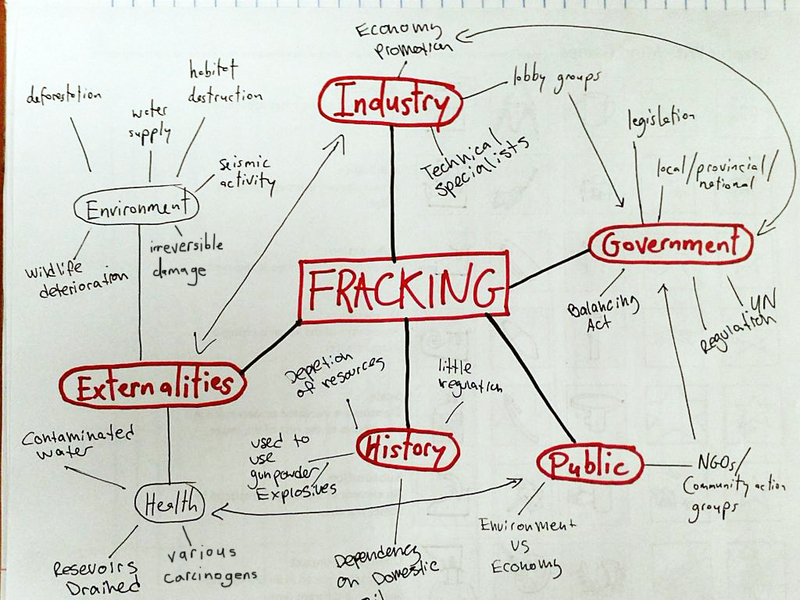 Fracking creates two main groups that become marginalized. This group is marginalized because much of the fracking happens close to, or on national parks. The drilling operations require roads to be built, which destroy habitat; there are emissions created from fracking camps, which damage wildlife, and in general the practice of fracking necessitates deforestation to gain access to the natural gas. People who live near fracking operations often have contaminated water supplies. This kills livestock, pollutes water systems such as streams and ponds, and contaminates drinking water reservoirs. Also, fracking requires millions of gallons of water. This is often extracted from local wells, which drains resources from nearby communities. My stance on fracking is that it is a necessary means to provide natural gas to a nation with a substantial energy demand. Not only does it contribute to the oil and gas industry as whole, which is one of the most profitable industries in the country, there is still no way to replace natural gas as our primary energy source. For that reason, it makes sense to completely harvest the natural gas from one deposit rather than beginning to drill another. My viewpoint is that the cons of fracking drastically outweigh its pros, and that it should be universally banned. There are dozens of ways in which fracking devastates the environment and compromises the health of the people living in areas where it is performed. Instead of turning to ever more harmful ways of extracting energy from the ground, we should be focusing on environmentally friendly alternatives, such as solar, hydro, and wind.